Introducing the latest addition to our collection of Ben 10 games – Ben 10 Critical Impact. The planet is in danger as the critical meteor shower is on its way. With Heatblast and Ghostfreak, Save the earth from the catastrophe! Because no one else can do it except Ben 10. 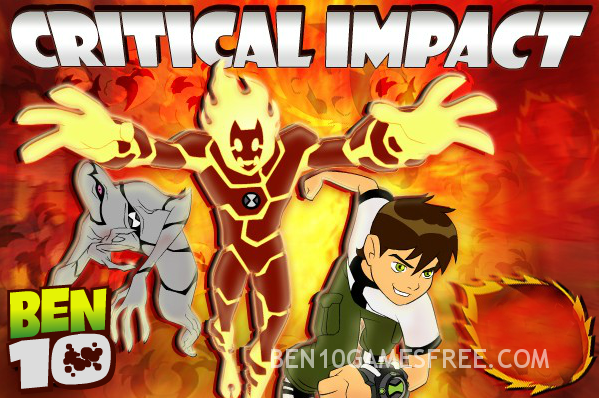 Ben 10 Critical Impact features Heatblast and Ghostfreak from the Ben 10 Alien force series. It makes up for an adventurous arcade game to play online. With meteors falling continuously, you must destroy them before they hit the ground or even you. Recommended : Play Ben 10 Omniverse Games online for free now! Ready to play Ben 10 Critical Impact? Wait, before that, you must read the gameplay. The main aim of the game is to destroy the falling meteors. How? Just transform Ben into Heatblast and use the fireballs to finish the meteors. Also, along with the meteors, there will come different obstacles in your way like rocks and fallen trees. And if you hit them Ben loses health. To pass through these obstacles, you have to transform into Ghostfreak and it will phase through the barriers. Pro Tip: Collect the green orbs to regain the health. Remember, there are two indicators on the top right corner of the screen i.e. Fire Meter and Health Meter. The more you fire the fireballs as Heatblast, the Fire indicator will decrease. On the other hand, Health meter indicates the power of Ben 10. The more meteors hit the ground or you, the health meter will go down. Well. now you have been told all you need to win this game. It’s your turn to do some action and adventure! Run across obstacles and the Destroy the falling Meteors to Win! Good Luck!! Don’t Forget to give your rating for Ben 10 Critical Impact Game and share your tips and tricks to win this game in the comments section below.